A picnic can be the perfect way to wrap up a nature hike. It can also be a terrific method of eating healthier and saving money while at a theme park. Picnic baskets can be terribly bulky and difficult to pack or organize. A picnic backpack offers an easier and affordable way to include picnicking in your life on your terms. 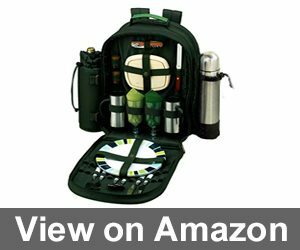 There are many wonderful picnic backpack sets that include everything you will need for a memorable picnic with family or friends. The sheer number of picnicking backpacks currently available is staggering. There are a plethora of specifications to accommodate seasoned picnic pros and others that include everything you’ll need for those new to the picnic game. 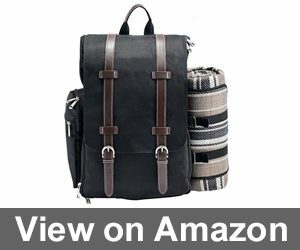 We’ve reviewed to top models and crafted a handy guide to assist you in finding the best picnic backpack for you and your needs. 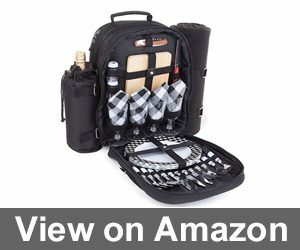 What Are the Important Features to Look for in a Picnic Backpack? What Do You Need for a Perfect Picnic? How Did Picnics Get Started? 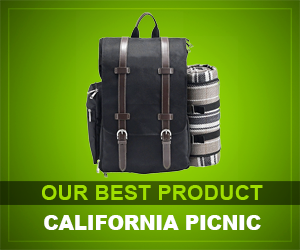 The Picnic Basket Backpack by California Picnic has everything you need for a successful picnic. The set includes a waterproof blanket, utensils, wine glasses, plates, napkins, wine corkscrew, cheese board, and a cheese knife all contained in a cute and functional bag. The bag even features insulation to keep foods and drinks at the perfect temperature. California Picnic’s Picnic Backpack is fully reusable. The utensils, wine glasses, and plates are all dishwasher ready. The bag is easy to pack and repack as well, so you will get plenty of use out of it. We loved how organized this backpack allowed us to be while picnicking. The Picnic at Ascot Deluxe Two Person Backpack Set has been crafted from a heavy duty, 600 denier canvas fabric. 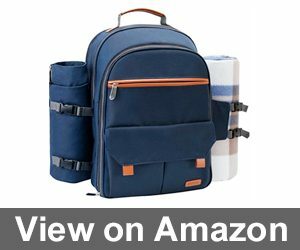 This feature means that this backpack will be perfectly suited for a picnic at the beach or for use while hiking or camping. It’s also extremely comfortable to wear thank to its aptly padded shoulder straps. The Picnic at Ascot Deluxe Two Person Backpack Set includes a coffee service for two complete with a vacuum flask and stainless steel mugs. The set also includes plates, napkins, utensils, cheese board, cheese knife, wine corkscrew, as well as salt and pepper shakers. 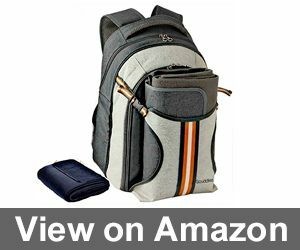 A special insulated pocket keeps food and drinks at proper temps while an insulated wine holder and a vacuum flask are placed on the bag’s side. The Oak & Olive Tremont 4 Person Picnic Backpack is a complete set up for four. It includes plates, acrylic wine glasses, cotton napkins, wine corkscrew, bottle opener, salt shaker, pepper shaker, cheese knife, cutting board, stainless steel utensils, and a waterproof fleece lined picnicking blanket. The bag is constructed from a heavy duty 600 denier polyester exterior so it will hold up perfectly to heavy use. The Oak & Olive Tremont 4 Person Picnic Backpack features two detachable, insulated wine carriers to keep your drinks at the perfect temp. The straps are comfortably padded and are trimmed in leatherette to increase their life expectancy. Overall our testing team really liked using this set up even though it is a bit more costly than similar versions thanks to its ability to hold extra wine. The Sunflora Family Picnic Backpack for Four understands that not all people like wine. 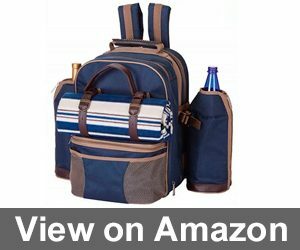 While this picnicking bag does have space and accessories for wine, it also includes a detachable waterproof pouch that works perfectly as an ice cooler for beers, sodas, or other canned beverages. Best of all, the rest of your food and supplies will stay completely dry and unaffected thanks to this backpack’s smart design. The Sunflora Family Picnic Backpack includes four sets of tableware, plates, napkins, plastic wine glasses, blanket, bottle holder, and plenty of space for food. Our testing team members with kids loved using this bag for family picnics and BBQ’s. We also loved how organized this set helped us to feel since there are dedicated spots for all of your picnicking essentials. The One Earth Home Four Person Picnic Backpack earned some of our testing team’s highest scores thanks to its awesome accessories. This bag offers full service alfresco dining for four. You will receive cloth napkins, solid stainless steel utensils, plastic wine goblets, salt shaker, pepper shaker, corkscrew, bottle opener, a bamboo cutting board, and a huge blanket that measures 58 inches by 51 inches. The blanket is much larger than other versions, making it a perfect option for picnicking with smaller children or babies. This offering from One Earth Home includes hand-stitched leather trimming rather than cheaply stitched straps. The fabric is durable, attractive, and easy to clean which makes picnicking much easier. Overall, the One Earth Home Four Person Picnic Backpack is one of our favorite versions thanks to its price point and excellent features for kids and grownups alike. The Scuddles Four Person Picnic Backpack is a cheese lover’s dream. 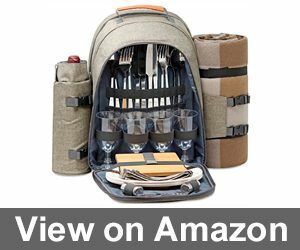 This backpack arrives with an elegant cheese board, a stainless steel cheese knife, acrylic cups, corkscrew, washable napkins, utensils, plates, salt shaker, pepper shaker, and a picnic blanket. The bag has a huge insulated pocket for food that measures 11 inches by 14 inches, giving you plenty of space for fancy cheeses, fruit, bread, crackers, and more. The Scuddles Picnic Backpack is less expensive than many other options, but it still is packed with tons of excellent picnicking essentials. The blanket is super comfy for relaxing on while eating. The Mister Alfresco Picnic dining set features a blue and white striped picnic blanket that would look amazing on the beach. The set has everything you need for four people including plates, plastic glasses, utensils, cheese board, cutting knife, napkins, corkscrew, and two detachable coolers. The bad features insulated pockets to keep your food at the perfect temp while you enjoy the great outdoors until it is time to eat. We love using the Mister Alfresco Picnic set on beach days or during family trips to the waterpark. The blanket has a special bottom that easily shakes away sand and dirt before folding it up. It is also perfect for families as kids will love helping to organize the items and food. The Plush Picnic Four Person Picnic Basket is the perfect picnic set for a newly married couple. It features complete service for four, so you can invite friends or just take a romantic break for you and your special someone. 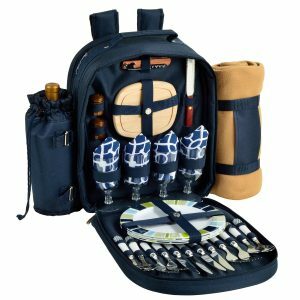 This bag has plates, napkins, cups, utensils, a cheese board and knife, shakers, and a detachable wine cooler, so it is perfect for enjoying a glass of chardonnay while hiking. The Plush Picnic includes a blanket that is waterproof to ensure you enjoy your time outdoors without being bothered by damp grass or bugs. This set would make a lovely option to use at a park or at the beach as well. Our testing team loved the super cute buffalo plaid design on the plates and napkins which adds a bit of a rustic touch to the set. 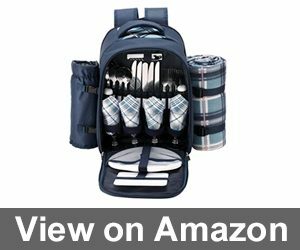 The VonShef Four Person Tartan Picnic Backpack offers a fabulous picnic at the perfect price point. This set up is available in four colors including red, navy, blue, and grey. 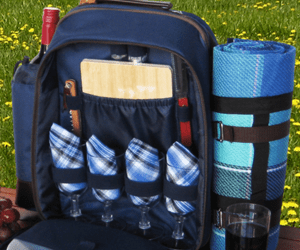 Each set has color coded items including a fleece tartan blanket, plates, utensils, cups, napkins, corkscrew, shakers, and a detachable wine cooler. The VonShef Four Person Tartan Picnic Backpack features comfortable padded shoulder straps. 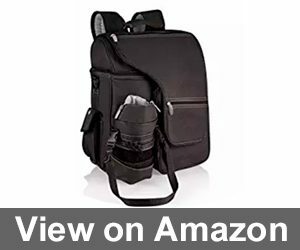 It also has a sturdy carrying handle in case you do not want to wear it backpack style. Our testing team loved that the Tartan Picnic Backpack set offers an elegant option at a very affordable price. 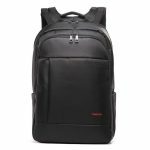 The Oniva Turismo Insulated Backpack Cooler offers a modern and stylish solution for individuals that take their picnics and hiking seriously. While this set lacks the fancy extras of other options, it has a streamlined appearance and is well equipped to hold the items you need such as water bottles and snacks. The Turismo has numerous pockets both internally and externally including a large insulated pocket to keep cold foods cool. 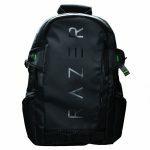 The bag has heavily padded straps for maximized comfort and a reinforced base. This bag would be a perfect option to use while rock climbing, sightseeing, bicycling, and more. Whether you are new to picnicking or have been packing lunches for years, finding the best picnic backpack may seem like an arduous task. With so many new options available with so many different features, finding the one best suited for your needs can be trying. We designed our buyer’s guide to help you understand the most important specifications and pick the one that works best for you and your needs. 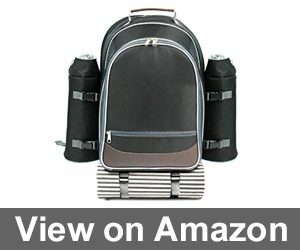 From backpacks that are filled with helpful items like a corkscrew or plates to insulated pouches meant to keep wine at the optimal temperature, each picnic backpack has features that make them unique. Understanding the small differences in these specs will give you an advantage when shopping for your best option. Let’s take a closer look at some of the most important features of the most popular picnic backpacks as well as the history of the picnic and tips to make your picnic the best day ever. Here’s a closer peek at some of the nifty specs that many picnic backpacks include. If you plan on using your picnic backpack while hiking, select a version with padded straps. The padding will keep your more comfortable on longer treks. You may also want to find an option with mesh lining on the areas that touch your skin like the back panel and straps if you live in a warmer area to keep sweating down to a minimum. Pick a picnic backpack with zippers that are strong and sturdy. You will be using the zipper to open and close the bag along with its various compartments so select one with pulls that are sturdy and work well. You also want to be sure that there aren’t any teeny tiny spots where the zipper doesn’t fully close. These spots are perfect areas where ants or other uninvited pests could infiltrate into your food compartments effectively ruining your picnic. Part of the allure of purchasing a functional backpack is that you can get and stay organized thanks to all of the awesome compartments. Look for an insulated pouch for perishable foods. There are few things as unsavory as warm cheese or hot water after a long hike. Avoid this picnic snafu by finding a backpack with insulation to keep things cool. Some bags are designed with wine connoisseurs in mind with a special wine bottle holder. You may want to go for a knapsack with a thermos option if you are a coffee drinker. You can also find special models that include straps and Velcro for keeping utensils organized or wine glasses from breaking. While it may not seem like a necessity, a blanket can take an okay picnic to a much more comfortable one in 5 seconds flat. Look for a waterproof or water-resistant fabric to keep yourself and your clothes cleaner. Many bags will have straps or a specially dedicated compartment to attach and store your picnic blanket when traveling or not in use. It takes more than a picnic backpack to have the best picnic ever. Here are some ideas for foods and other items you may want to bring along. Cleaning up after the picnic is our least favorite part. There are a few ways to make this step easier. You can use Tupperware to package up other foods like hummus, salads, and other side dishes to keep messes to a minimum. Don’t forget to pack extra serving spoons or salad tongs for easy service. Bring some extra bags along to place dirty dishes or trash in so you can clean as you eat. Next time you are at the dollar store, grab a few inexpensive squirt bottles to use for ketchup, mayo, relish, and other condiments. They are clean and spill proof which makes picnicking, especially with kids, easier than ever. Bring along some hand sanitizer and baby wipes. These items will cut down on cross-contamination and sticky hands. You may also want to make a list of your picnic items and laminate it so that you never forget anything you need. Picnics were once a fun activity for the super wealthy and consisted of huge, outlandish, lavish feasts outdoors. It was a sign of wealth and status to hold a picnic. The outdoor feasts were held to impress guests and often went on for days or even weeks. During Medieval times, picnics were often held during hunting trips and included tables, chairs, and servants. In the mid-19th century, the feasts began to more closely model what we know as picnics as the practice became more mainstream and streamlined. Picnics are surging in popularity again as the perfect activity or a way to save money when on vacation, sightseeing, or visiting a theme park. This activity is fun for people of all ages from children to grandparents. The right picnic backpack can offer an organized way to fully enjoy your time with your family and friends without stressing out over small details like whether you remembered salt shakers or a cutting board. Whether you are planning a romantic picnic proposal for your loved one or a small get-together for family and friends, the right picnic basket can take your day from ordinary to amazing. Lazy, hot summer days are just perfect for packing up some yummy food and drinks to share with your loved ones. A picnic backpack is a terrific method to make picnicking easier and more fun. We hope that our reviews and picnic backpack buyer’s guide assisted you in understanding what you need and what you can skip. We would love to hear about your picnic tips and tricks. Please drop us a line below with your thoughts and ideas on the best picnic backpacks and what your top picnic snacks are. I like the way The Oak & Olive Tremont 4 Person Picnic Backpack looks like. I think such backpacks collect more likes on Instagram than the others. I will probably buy it to make my feed more sophisticated. Haha, do you really buy things because they look good on Instagram? The Picnic Basket Backpack by California Picnic is the best for me. I haven’t tried it but the way it looks is amazing! I can’t understand why people buy special backpacks for picknicks. There are usual bags and backpacks. Can someone explain to me? If it’s all about Instagram shots, so stop the world cause I wanna get off of it. They are just very comfortable for holding bottles, containers and other stuff one uses on a picnic. If you can buy it, why not? Nobody has written about The Picnic at Ascot Deluxe but I find it the most convenient backpack. It has so many places for your picnic staff so you won’t have any problems. Oh, I like this backpack too! I’m glad to find one more fan of this product. I like when brands concentrate on one thing. In this way they get the best products on the market, That’s why my choice is Oniva Turismo. 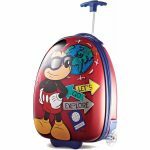 I find this backpack the best among all the variants for picnics. We go to picnics with our best friends, so there are always four of us. When I was searching for a special backpack, I found Sunflora Family. And its design was so great for me that I bought it without thinking for a long. Now I hope it’ll be durable. I have never had a picnic backpack before, but my sister presented it for me on my Birthday. So now I’m happy that we can go for a picnic with the children and everything will look pleasant. Speaking about the specific model, my backpack is Sunflora Family. I like it so much and recommend to all my friends now. I like when everything is already included and you can spend less time but get the best product. Such a situation happened with me when I bought Mister Alfresco. It’s a great backpack which looks great. Agree to you! I use the same picnic backpack, and the whole family lokes it. My friends are going to buy this one too. The best thing about Scuddles 4 Person is that it costs not very much and the organization of all utensils doesn’t take a lot of time. I can easily find everything, and my family appreciates this backpack too. We presented Plush Picnic 4 Person to our friends when they had a wedding. I saw how happy they were with this present so I think our family should buy the same picnic backpack. Just look at the design and you’ll understand everything. It was a surprise for me to find out that there are so many less expensive options on the market than the picnic backpack I bought last week. Unfortunately, I won’t return it but I’ll know that your website is so helpful for my future purchases. Thanks! My husband bought Picnic at Ascot Deluxe for our anniversary, and I couldn’t be happier than I was then. Now we have a good tradition to go for picnics together taking wine or coffee with us. My children really like Sunflora Family and I like watching at their wide smiles when we go for a picnic. Recommend to everyone who has a big family and like spending time outside.